Set oven control to broil. Place bell peppers on cookie sheet. Broil with tops about 5 inches from heat, turning occasionally, until skin is blistered and evenly browned. Place peppers in a plastic bag and close tightly. Let stand 20 minutes. Meanwhile, in tightly covered container, shake oil, lemon juice, parsley, onion, oregano and garlic. Remove skins, stems, seeds and membranes from peppers. Cut peppers into 1-inch pieces. In glass bowl or jar, place peppers, olives and cheese. Pour marinade over pepper mixture. To serve, use slotted spoon. Serve with baguette slices. 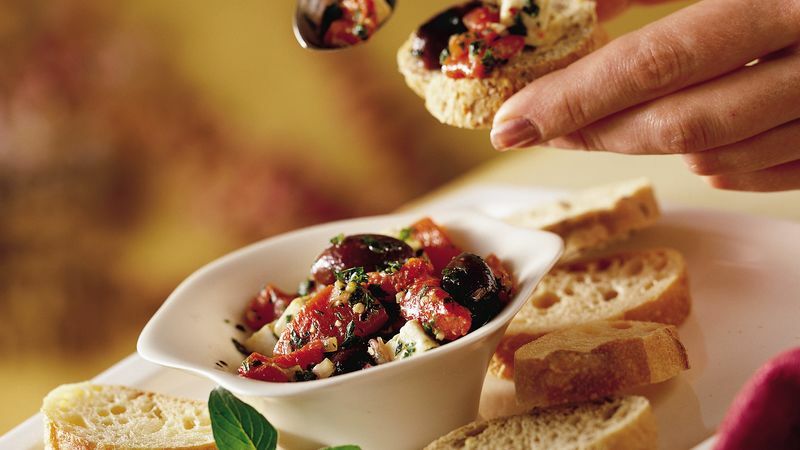 For authentic flavor, use kalamata or Gaeta olives, but you can also use large pitted ripe olives if you prefer. Store this appetizer in a tightly covered container in the refrigerator up to 1 week.